Photo shot on iPhone 6 and modified with DateStamper (vibrancy effect). When I was a kid, my parents used to take a lot of pictures. Family gatherings, vacations, Sunday road trips, our dog growing up. They weren't photographers by any means – they just wanted to document our lives and create memories. They useddisposable Kodak cameras most of the time – lots of them. Before smartphones and when “cellphones” meant this, those thousands of pictures collected in dozens of photo albums are the ones that stuck around to this day. They haven't been lost in a cloud backup. They're in my closet. One detail that equally bothered and amused me about our photos was the date stamp in the bottom right. Back in the late '90s, we had no digital cameras and all our photos existed on printed paper thanks to a photographer who used to run a store that offered camera equipment, disposable cameras, and photo printing services. And because my parents were friends with this photographer, all our photos had a date stamp in the bottom right corner as, back then, metadata had to be printed as well. This was before EXIF and photo apps and Dropbox and file names. Date stamps were part of my photos. I'm told that the photographer is still in business, but he doesn't print photos anymore – he shoots photos at weddings now. 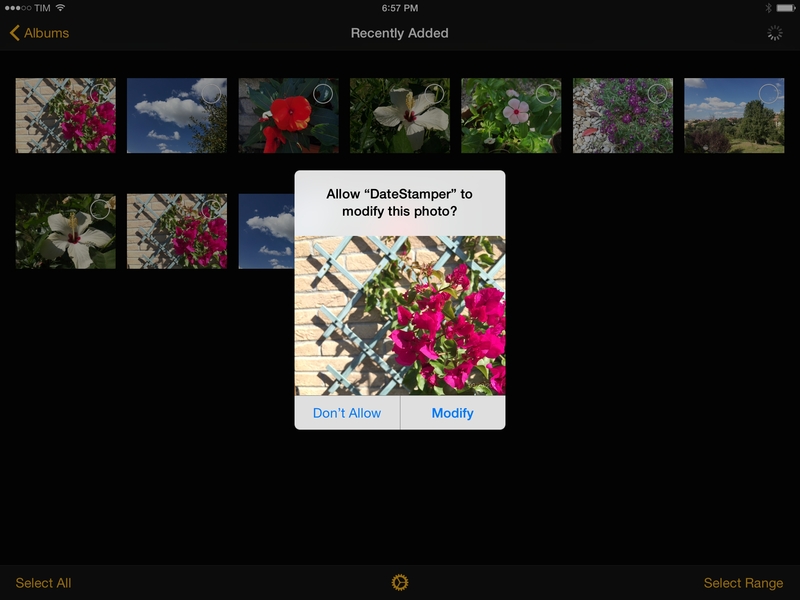 With iOS 8, Apple has added date information to photos – a feature that partially fixes the problem of lack of metadata viewing in the Photos app. But you may still know people who want old-fashioned date stamps like my parents or you simply want to add date stamps on top of your photos to have a clear understanding of creation dates on any device. Developed by Jordan Hipwell, DateStamper lets you add date stamps to photos in a variety of ways thanks to iOS 8 and extensions. DateStamper is a Universal app with no ads and a simple interface. In the Settings, you can choose a format for your date stamps as well as fonts and colors. I like that you can go with traditional solid white or use the new vibrancy effect of iOS 8, which looks great on the Retina display. In the app, you can edit up to 20 photos at once, for free; by unlocking a $0.99 In-App Purchase, you'll get the ability to apply date stamps to more than 20 photos in a single session. 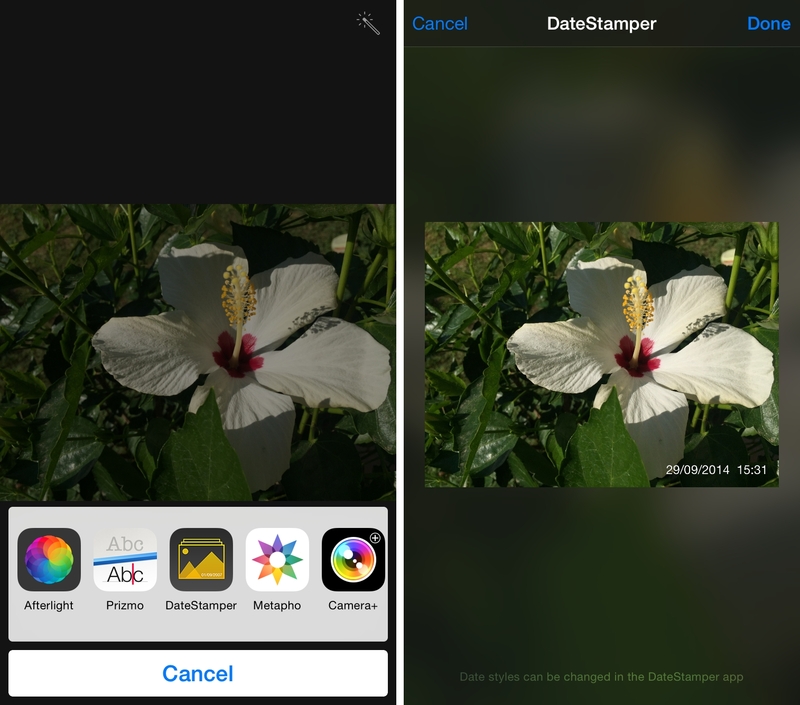 DateStamper uses iOS 8's new non-destructive photo editing controls: the app can overwrite the original photos without creating duplicates, but you'll have to confirm changes to each photo from a popup preview. Changes can be reverted at any time from the Photos app; if you're using iCloud Photo Library, DateStamper's edits will propagate across all your devices automatically. You can also use DateStamper as a photo editing extension in the Photos app: tap Edit, choose DateStamper, and a date stamp will be applied to the currently selected photo using the style you've set in the app. The extension is a nice way to quickly stamp a single photo you want to, say, share over email or iMessage. DateStamper brings back old memories for me, but it is, first and foremost, a handy iOS 8 utility to apply date (and time) stamps to photos. It looks good, it gets the job done, and it's nicely integrated with Apple's Photos app. DateStamper is free on the App Store.